Cape Bernier Vineyard is located overlooking beautiful Marion Bay and this position is perfectly situated to take advantage of the sunshine and cool sea breezes – ideal conditions for growing Pinot Noir, Pinot Gris and Chardonnay grape varieties. With the first vines planted in 1998, Cape Bernier Vineyard has established a reputation for wines of the very highest quality, and the Vineyard has won many awards including a 4.5 star rating in the Australian Wine Companion 2013, Tasmanian Vineyard of the Year 2010, and has consistently won medals at Tasmanian wine shows. The Cape Bernier Sparkling Cuvee Rose is absolutely perfect paired with the summer berries that are in season right now. The following recipe for a Rossini is a refreshing and celebratory cocktail that perfectly reflects the taste of a Tasmanian summer – just in time for the hot days to come this week! The BCFM Committee thanks Cape Bernier Vineyard for their generous sponsorship of the Bream Creek Farmers Market Cook Book. Cape Bernier have a small cellar door and welcome visits by appointment – you can also take a picnic along to enjoy in their beautiful grounds. To visit, please call Cape Bernier on (03) 6253 5443. 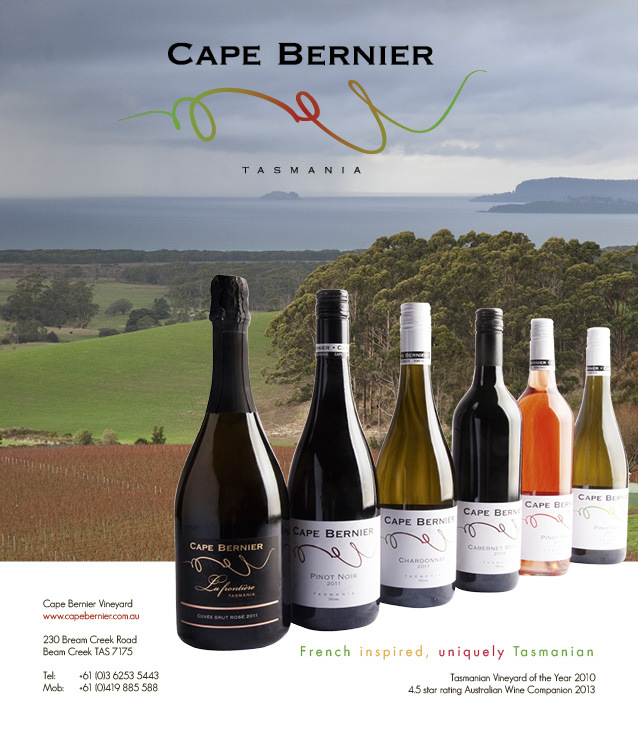 Cape Bernier wines are also available for purchase on their website and of course, on the first Sunday of every month at the Bream Creek Farmers Market. This festive and refreshing cocktail is a fabulous way to start a party and is easy to make in larger quantities for a bigger celebration. Chill six champagne glasses in the refrigerator. Using a food processor, puree the hulled strawberries until smooth. Strain through a sieve to ensure there are no seeds in the puree. Distribute the puree between the chilled champagne glasses and top with the cold Cape Bernier Sparkling Cuvee Rose. Serve immediately. Fresh peaches are traditionally used as a puree to serve with sparkling wine, this combination is called a Bellini. Try substituting other stone fruit or berries for a lovely variation, taking care to strain the puree to ensure it is completely smooth before adding the sparkling wine.